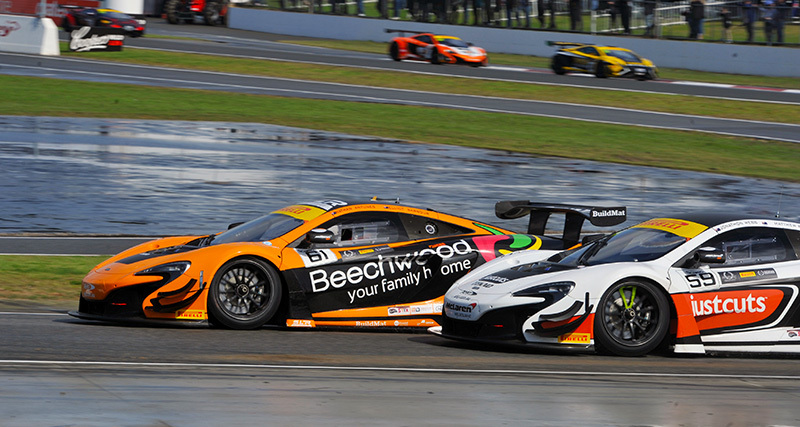 After battling unpredictable weather conditions at round three of the Australian GT championship, my team mate Elliot Barbour and I brought the Beechwood Homes/SLR/BuildMat McLaren 650s GT3 to a podium finish in race two and a top five position for the weekend. It was obvious from the first practice session on Friday morning that the weekend was going to be tough yet very exciting with the weather looking inconsistent. We hit the track on cold, slick tyres with Elliot and I both cutting laps in the 20 minute session. We had some work to do in preparing our brakes and getting the set up right for the conditions. The very low grip on the track made it difficult, but the setup from the Tekno McLaren team felt good and gave us the confidence to move into qualifying. Elliot took the car for qualifying 1 on a very wet track. New wet tyres bolted on the car, the session went green and within a few laps Elliott was sitting comfortably in the top 3. The times started to plateau as the abrasive surface at Barbagallo Raceway ate into the wet tyres and in the dying stages of the session, a few teams pulled in the pits to change to slick tyres. We had decided to stay on wets because we couldn’t see the track drying enough for there to be an advantage, but unfortunately we were wrong and dropped to 8th in the last seconds as some cars managed to get just enough heat into the slicks to improve their lap times. The car was feeling great and we knew we had a good set up package if the weekend was to continue to be wet. It was my turn in qualifying session 2 and this time there was no chance of the track drying with heavy rain throughout the first half of the session. I was able to get into position 2 before pitting to make a few set up changes. With time running out I wasn’t able to improve and dropped to 4th but was very happy with the result. Unfortunately 4th position in qualifying 2 didn’t change our start position for race 1, because the session was not faster than the previous due to the heavy rain, so we remained in 8th. Again the weather played a big part in the excitement of the race. All cars started on wets. The start was strong and I got into 6th position, but the rain stopped and the track started drying quickly. I could feel the wet tyres beneath me disintegrating and could see the same thing happening to the cars around me. The safety car was deployed due to a car stuck in the sand trap and we saw this chance to pit early outside our compulsory pit window, change to slick tyres and gain the advantage on the rest of the field. This was only going to work if we could complete the pitstop before the field came around behind the safety car. We were seconds away from pulling off a genius manoeuvre in strategy but were just not quick enough to do the tyre change and we fell a lap behind. Elliot jumped in the car at the compulsory pitstop for the second half of the race and was quick, but being a lap down we finished 13th and wondering what could have been. Elliot started the race this time and after just two laps got the car into 9th position. Unfortunately, the race was stopped due to an accident on the exit of the last corner when the Audi of Geoff Emery hit the wall after contact from one of the Lamborghini’s and Geoff required medical attention. Because of the long stoppage only the last 25 minutes of the race could be run, so all the co drivers had to jump in and finish the race without the compulsory pitstop. This meant that the pitstop time penalties were added at the end of the race. When the race restarted, I quickly made my way up into 5th position and kept within the leading pack to cross the line in 5th. But with the post-race penalty calculations for the field placed us in 2nd place for the race, salvaging our weekend and putting us in 5th overall. 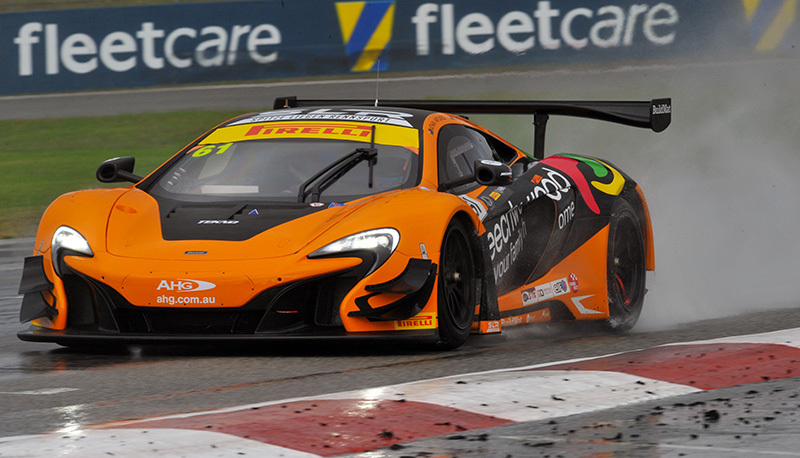 A great overall result that moves up to 6th spot on the Australian GT Championship leader board. 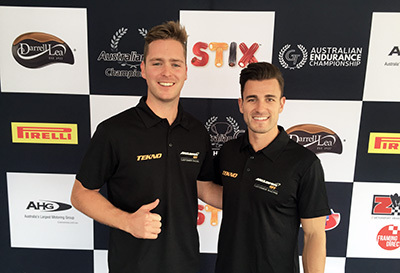 We are looking forward to the next round of the championship at Phillip Island Circuit on 27 and 28 May. 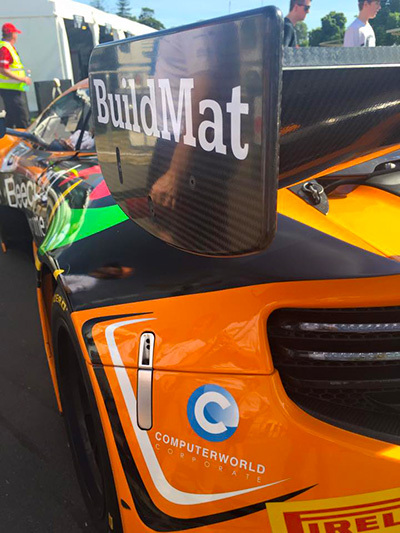 A big thank you to Novati Constructions for some excellent on-board footage delivered by Fox Sports and V8 Supercars.